The Historical Society of Washington D.C. hosts Capital Pride’s Heroes Gala at Carnegie Library (801 K St., N.W.) on Saturday, May 13 from 7-11 p.m. The event is ordinarily held in June but was bumped up to mid May this year. 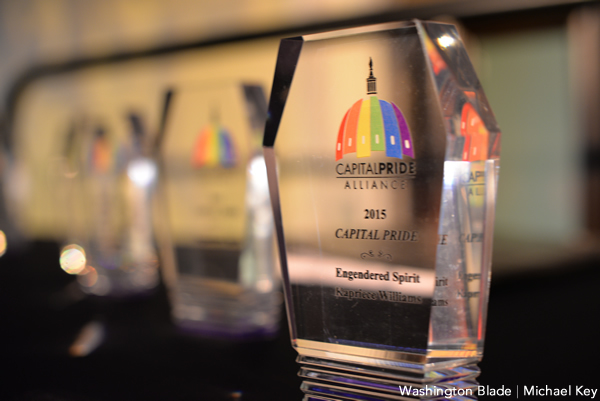 Capital Pride Heroes honors individuals who have made a positive and significant contribution to the LGBT community. Honorees this year include Dee Curry, Juan Carlos Loubriel, Amy Loudermilk, Richard Rosendall and Melvin Thomas. Stacey Karen and Hayden Mora will also be honored for their contributions to the transgender community. Other awards include the Ally Award which will be given Washington Capitals goaltender Braden Holtby and the Larry Stansbury Award, a recognition of an organization that has contributed to Pride, that honors Brother Help Thyself. There will be entertainment, an open bar and food-tasting stations. Tickets are $65. For more details, visit capitalpride.org.